If you can't decide between pizza and tacos, you can get them both in one delicious bite at Pizzana. 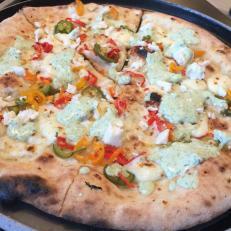 The Messicana Pizza is inspired by the owner's wife's favorite taco. A delicious hand-tossed pizza crust is topped with pickeld chiles and jalapenos, Mexican queso fresco, chorizo, and fior di latte. After cooking until hot and bubbly, it's topped with a tangy cilantro-lime sauce.